NEW YORK�(CNNMoney) -- "Cut, cap and balance" is fast becoming the catchphrase of those who say they are serious about fiscal responsibility. -- and amend the Constitution to require Congress to balance the budget every year and make it more difficult for lawmakers to raise taxes. Last month, 103 Republican House members signaled their support for Cut, Cap and Balance. 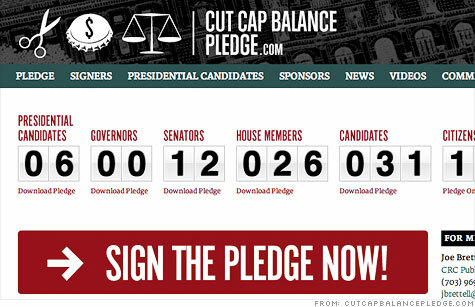 Meanwhile, most of the Republican presidential candidates, 12 senators, 26 lawmakers and 31 congressional candidates have signed a pledge stating that they will oppose any debt limit increase unless all three conditions of "Cut, Cap and Balance" are met. Supporters say the Republican Study Committee proposal will prevent a debt crisis and "rebuild private sector confidence and help businesses see reasons to hire once more." But seasoned budget and economic experts disagree. They say the proposal is not a realistic framework and is not likely to achieve the goals supporters of the plan believe it will. "[Cutting] $380 billion is about 10% of total projected federal spending in 2012 and that would cause an almost immediate economic disaster at any time, but especially when there's no indication that the private sector will increase its spending to make up the difference," said longtime budget expert Stan Collender. Barry Anderson, a former Congressional Budget Office director, said he doesn't have a problem in theory with the idea of reducing spending by $380 billion or capping spending at 18% of GDP. But, he said, "tell me how you're going to get there, a credible way to get there." Anderson noted that it would take huge cuts to hit those targets in such a short period of time. For example, the Committee for a Responsible Federal Budget estimates that by 2020 total spending will be 24% of GDP -- 5.2% for Social Security, 6.2% for federal health spending, 3.8% for interest on the debt and 8.6% for everything else, including defense. "Will they cut defense to 1% of GDP? Health spending to 4.2%?" Anderson said. Democratic budget hawk Alice Rivlin, the founding director of the Congressional Budget Office, has said that 18% is not feasible "when we have a huge generation of baby boomers moving into retirement, longevity is increasing and medical costs are high and rising." As for a balanced budget amendment to the Constitution? "I do think it's quite reasonable to get us on a path to a balanced budget," Anderson said. But he doesn't believe a balanced budget -- where total spending equals total revenue -- is realistically achievable in the next 10 to 20 years. The first step, he believes, should be to stabilize the country's accrued debt at around 60% of GDP over the next decade. Currently debt held by the public is approaching 70% and is expected to top 100% by 2020. And, Anderson and others noted, amending the Constitution as a way to lock in a balanced budget can create more problems than it fixes. The Cut, Cap and Balance proposal doesn't offer a specific balanced budget amendment, but two signers of the pledge -- Rep. Joe Walsh and Sen. Orrin Hatch -- have proffered their own. Walsh and Hatch would prohibit total spending from exceeding 18% of GDP in any year unless a supermajority of lawmakers in the House and Senate approves a higher amount. One exception: A declaration of war, when only a majority vote would be needed for spending to top 18%. Both their proposals also would require a supermajority of votes for any new tax or tax increase. Moreover, many say, capping spending at a percent of GDP doesn't make allowances for recessions or financial crises, when revenue -- and GDP -- fall and demands for government spending increase on programs such as unemployment insurance. So to keep spending at 18% of GDP can mean steep cuts and possible tax hikes at exactly the wrong time. Some have suggested that one possible way around that straitjacket is to set spending at 18% of "potential GDP" -- that is, what GDP would be if the economy were humming at full employment. But even that's problematic, economist Simon Johnson told the Joint Economic Committee last month. "How do you define potential GDP? Who is going to be the arbiter of this? ... [T]he cross-country experience with very tough and hard budget rules of this kind is they're only as good ... as the Congress or the equivalent body, because you can always find ways to redefine potential as circumstances change."